Anyone who has read my previous posts will know that we had a very early teether! His first two teeth came through at 3 months old and we were not prepared at all! Fast forward to 9 months old and we have just had tooth number 7 pop through – and boy has this one been tough (and taken its time). Teething is one of those things that no one can prepare you for. It affects so many things – sleep, mood, eating, and therefore can really take it’s toll on the parents. And it seems as though it’s never ending. You finally think the tooth is through, and out pops another! After trying lots of different products, I have come up with a list of my top 5 items which I feel have helped us through the teething process. 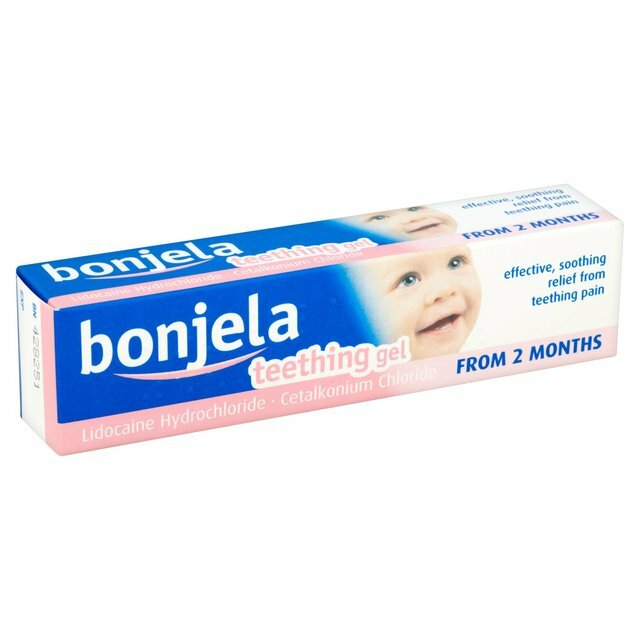 When his first tooth started popping through at 3 months old, I went straight to the chemist and picked up some Bonjela teething gel – as it was the only thing that I had really heard of for teething pain, and I knew it could be used from 2 months. I applied it as per the recommendations on the packet, and found that it started giving some relief to the little man straight away. One downside was that the relief was short lived at times depending on how much he was drooling, or how well I was able to apply it (without him clamping down on my finger). Overall though, this normally always does the job for some immediate relief. This comes everywhere with me. 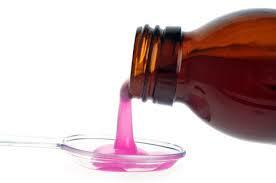 Paracetamol liquid (or as most of you know it – Calpol), is great for teething pain when it is really severe. We use Paracetamol liquid mainly at bedtime to help with the pain overnight when we know there is a tooth trying to pop through, and it really does help limit the pain which in turn seems to help sleep. Well, what many people don’t realise is that the ingredient in Calpol is paracetamol, and all supermarkets / big chemists do their own versions which are exactly the same, yet cheaper! Check the ingredients next time you are there, and ask your friendly pharmacist if you are unsure. At 3 months old we had to hold Sophie in place for the little man, but as his co-ordination got a bit better, he loved chewing on it. The great thing about Sophie is the number of positions she can be used in, and how easy it is for the babies to grip. Plus the texture is great so it doesn’t hurt babies gums. I discovered the matchstick monkey after attending a baby show – and i’m so glad I did! The matchstick monkey is a soft and gentle teething toy with texture for the gums. 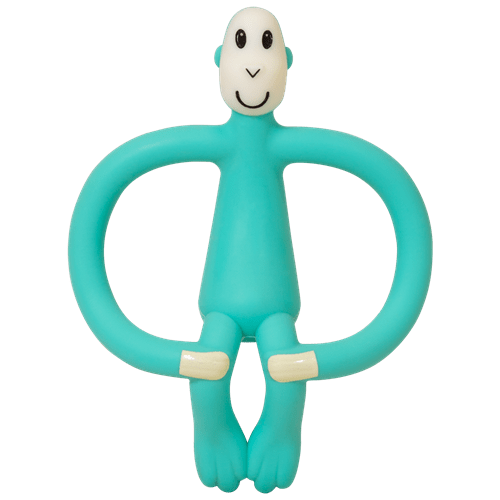 The arms are wide enough to ensure your baby can get a good grip, and what I particularly like about this product is that it can be put in the freezer – which is great for teething pain. As well as biting on the monkey, the back of the head has bumps, to which teething gel can be applied. I use this function quite often as I do not want to put my fingers in the little mans mouth now he has top and bottom teeth! One of my first concerns when my little boys first 2 teeth popped through was how I take care of them. That is where the great team at Brushbaby came in. They advised that it was never too early to clean the little mans teeth, and this little set is perfect. 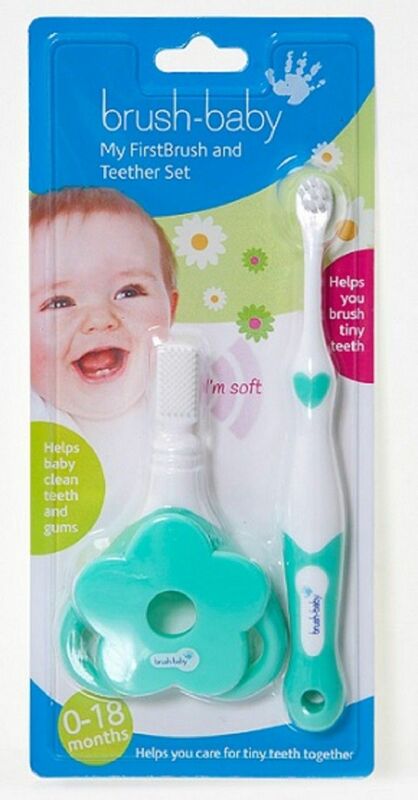 The firstbrush has very soft bristles which are extremely gentle on his gums. We use this with their teething toothpaste which contains chamomile to help soothe sore gums. The first teether is great for carrying in my change bag for when we are out and about due to the small size. It can be cooled in the fridge, and can also be used to apply teething gels. Wow! 3 months!!! That really is early! 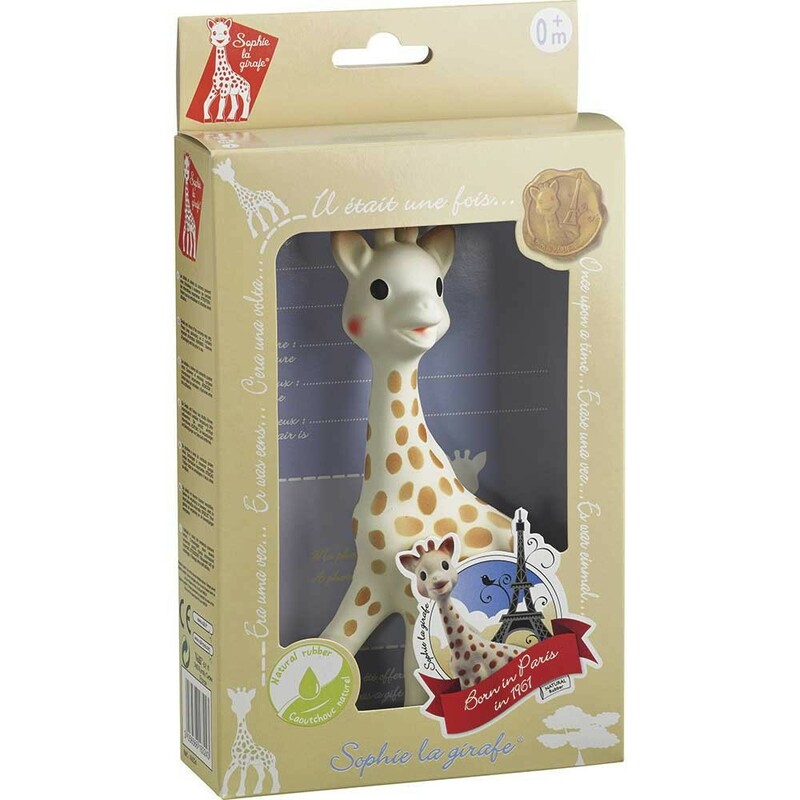 I think we are the only family in the UK who’s never had a Sophie the Giraffe!!! Although I have heard of it – I had never heard of Matchstick Monkey though! Have you ever tried teething granules? Thank you for sharing and for linking up at #KCACOLS. Hope to see you again next time! Lots of people haven’t heard of the matchstick monkey but it’s so good! Yes, we tried granules but it was very hit and miss for us! I’m sure I’d get funny looks if I tried Sophie the Giraffe i’d get funny looks, but i never go anywhere without Bonjela and I’m a 45 year old, with sensitive teeth and gum disease.